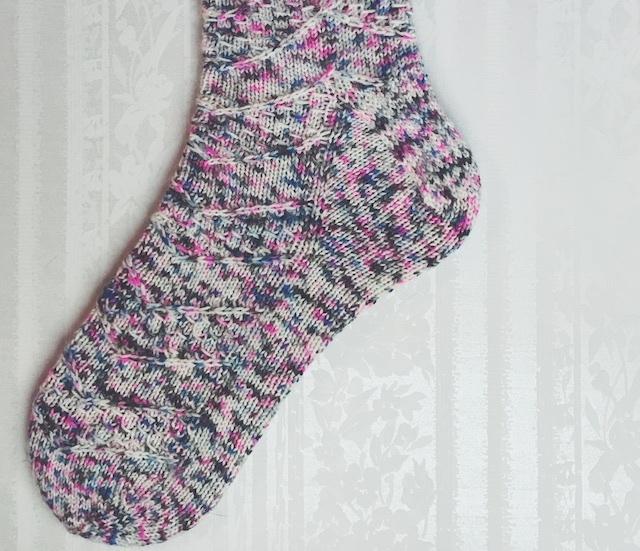 I finished this pair of Speckled Space Socks that make me think of Viper Pilots' Wings about a week ago, then immediately cast on for pairs 11 and 12. On a deadline here for Box o Sox. So let me tell you about them, because I know all of the internet can't wait to read about a pair of socks. 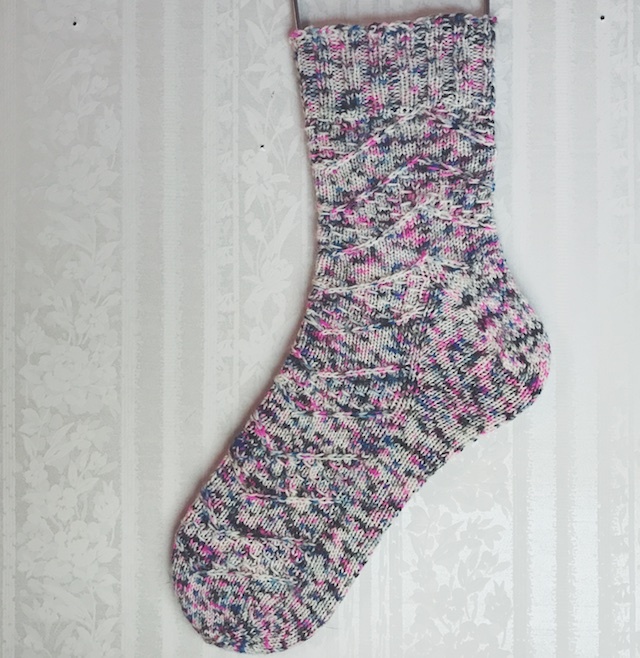 I used the Speckled Space Socks pattern by Amanda Stephens. 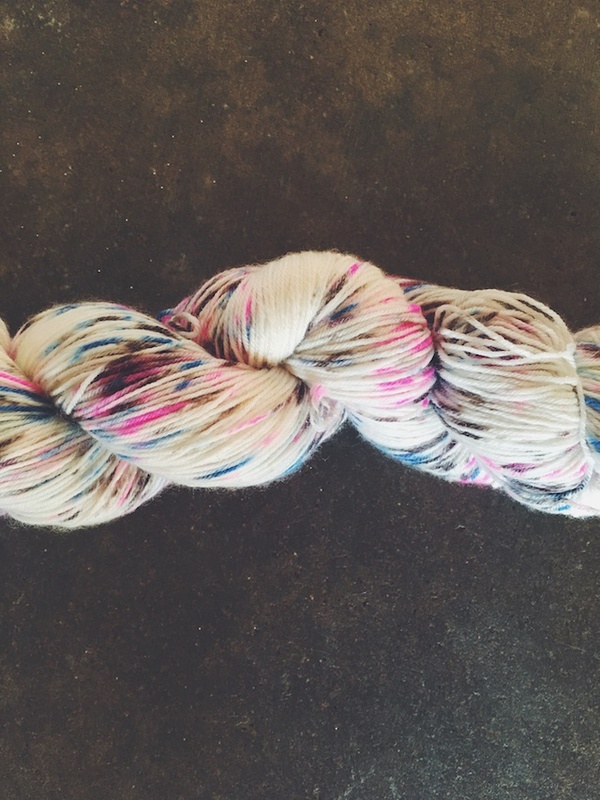 She made the pattern for colorful, speckled yarn. It's not too busy, but busy enough. And I think it looks good with the yarn I chose. However, I think it would be killer with a semi-solid yarn. To get an idea of how that would look, check out Candace's socks. Don't they show off the stitch pattern much better. You can see in the photo below how this colorway would knit up in stockinette. Nice. Mine are fine, as is. I wanted to use this exact skein in the Stellar colorway with a stitch pattern that was also space themed for the Socks in Space KAL. Goal achieved. I really love all of these bright speckles. It's Red Sock Blue Sock Yarn's discontinued Basic Sock base. I think I bought it over a year ago, but have been holding onto it for something special. 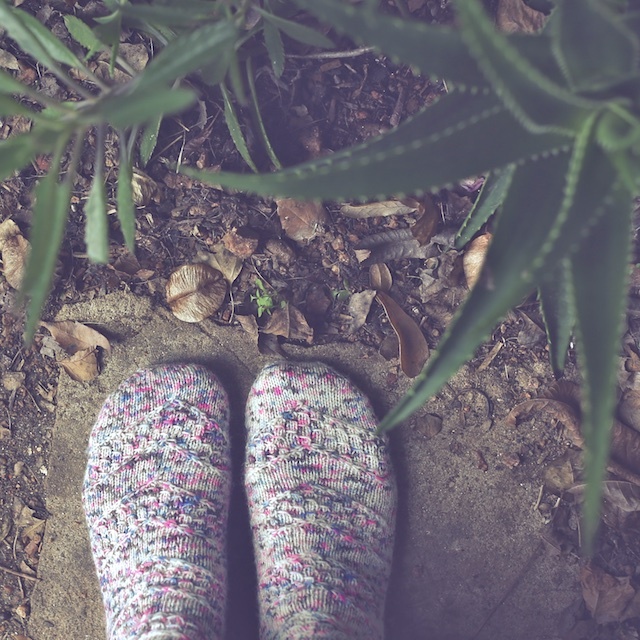 Though it knit up nicely, I do prefer their new Comfort Sock base, which I used for my Wildflowers and Honeycomb socks. It's a little fuller and maybe more elastic. Not really sure on that since I was knitting a cabled pattern on size 0 needles. It's possible they're not as squishy because I yanked the heck out of my yarn. I think sometimes the topics of my blog posts sound like product placement, a not-so-lucrative form of product placement. I can't help but tell what I love, and I love Red Sock Blue Sock Yarn. I try to branch out and try yarns from all the dyers I follow on instagram, an ever-growing number, but I still have a special place in my heart for some. RSBSY is one of those. They're having a big 20% off sale today only and I am restraining myself. Sigh. I have spent all my free cash on Christmas and need to exercise self-control. My self-control basically involves waiting a couple of weeks until my birthday. This was a toe up pattern, which leaves me with a less neat cuff. What's the secret, friends? How can I bind off with a stretchy bind off that doesn't leave me with a stretched out, floppy cuff. 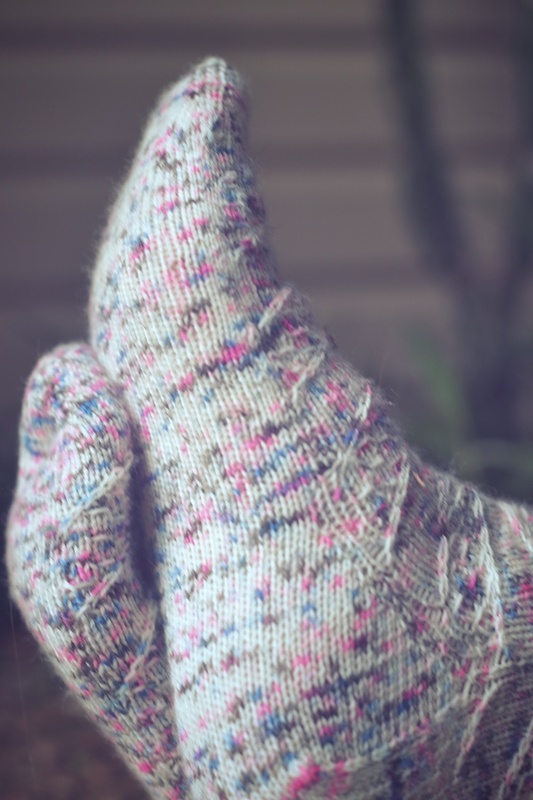 A regular ribbed bind-off isn't stretchy enough. I mean, it's not bad now, but I'm thinking it might be really loose eventually. Whereas, I love my cuff-down cuffs. They're tidy looking, whether I am wearing them or not. Is this a common issue? Okay, so details: I used US size 0 Karbonz and the discontinued Basic Sock yarn from RSBSY to knit one- at-a-time, toe-up socks. I cast on for the 56 stitch size and knit about 6.5" before starting the gussets. I repeated the stitch pattern a total of 5.5 times. These were knit along with the Socks in Space KAL, hosted by Candace of the Pinfeathers and Purls Podcast and Robyn and Merry from the Cherry Purls Podcast (which I haven't seen yet). Here are some more finished pairs on Ravelry. They're also pair number 10 for my #boxosoxkal, a hashtag that feels more sinister ever time I type it. 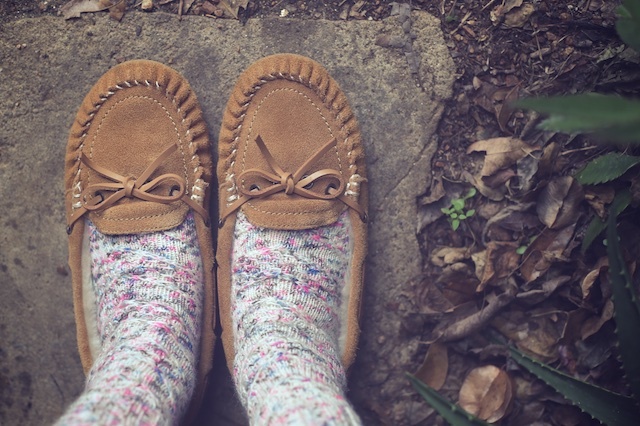 Here's my other post about these socks.